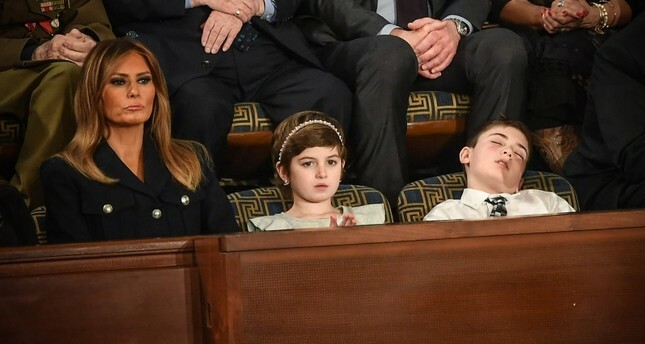 Between the late bedtimes and early morning tweets the leader of the free world is renowned for needing just four hours' sleep but his young State of the Union guest Joshua Trump hardly lived up to the name -- nodding off mid-speech. The 11-year-old -- who is not related to Donald Trump but has been bullied at school because of his surname -- had been invited as a special guest of the first family to the prestigious annual address. The youngster was seen looking presidential in a white shirt and dark tie as formalities commenced in Washington on Tuesday evening but he soon succumbed to the apparently soporific cadence of Trump's words. Images of him catching 40 winks quickly went viral on Twitter, where many hailed him as an unlikely talisman of the anti-Trump "resistance" while one wag remarked: "Joshua Trump spoke for all Americans." "Joshua Trump is a Trump I can get behind," quipped another while a third enthused: "Not all heroes wear capes." "They say are you related to Donald Trump? And I say, 'Would I be here if I'm related to him?'" the schoolboy told the news site Inside Edition in December. "The first lady is in a very difficult position," Claudio Cerullo, the founder of the site TeachAntiBullying.org, told AFP. "I'm hopeful that she's very impactful upon on her husband."